Learning Participants: Should They Be In Control? Don’t use a next button for navigation. Have learners choose their own path. Proponents of this learner-centered approach tell us that people learn best when they are left to discover and come to their own understanding. You’ve likely heard popular terms for this approach: Discovery learning and inquiry learning. Opponents of this approach say that true learner-centered approaches deliver the needed learning content, path, and activities based on what people already know and what they are trying to learn. They explain that people with less knowledge of the topic are unnecessarily frustrated using a less directed approach. We know that people can and do create their own learning paths and learn on their own all the time. We’re not asking if people can learn on their own. They can. They do. We’re asking whether this kind of a learner-centered approach helps people learn more efficiently and effectively when designing instruction. In this article, I’ll specifically address a central issue around helping people select their own path to learn: Learner control. We’ll discuss the continuum between learner control and program control. And I’ll explain typical control elements and what research says works best for different types of participants and learning situations. The implications are actionable and valuable to the everyday design of workplace learning materials. I’m a fan of tactics that help us instruction likely to have better outcomes! 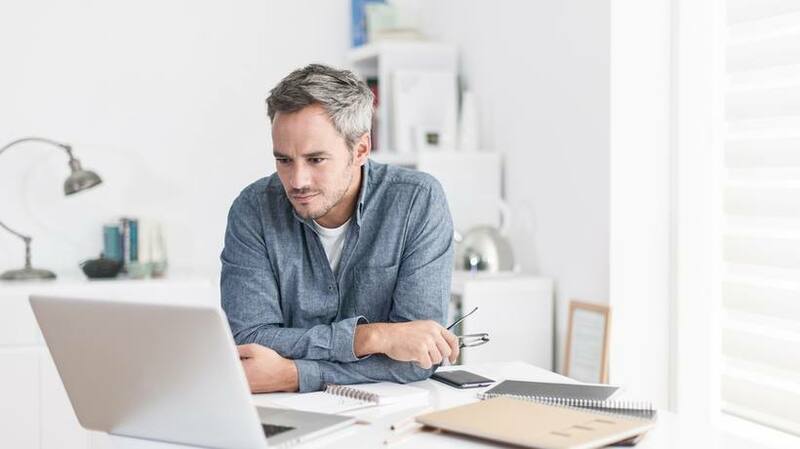 Research on learner control generally starts with differences between learner control, where the person learning controls the learning environment and program control, where the program controls the learning environment. Learner control is about choices people can make on how to use and go through a program. In program control, the program makes these decisions for the user. In real life, we often design somewhere between these two ends of the control continuum (Figure 1). In the in-between zone, some choices are left to the user and other choices are made by the program. 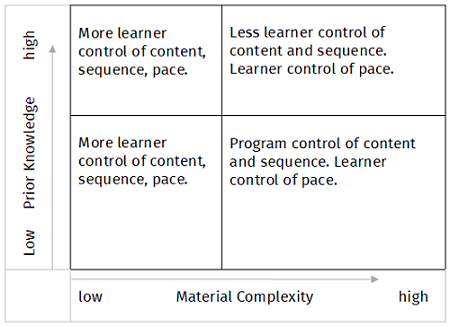 The research discusses elements of control: content, sequence, and pace (Table 1). Which of these should learners control and which should the program control? Proponents of a typical learner-centered approach might say that learners should fully control all three, including whether to use the instruction at all. Content Chose which objectives or segments to use. Lana skips the first three segments as she already knows this information. Sequence Chose the order in which to use segments. Marco views the segments in the Interview Techniques heading first because he begins the interviews for a graphic artist tomorrow. Pace Chose the speed of instruction, including starting, stopping, and continuing of the program and media elements. Sanjay plays the videos multiple times as he is taking notes and wants to be sure he got the important information correctly written in his notes. Interestingly, opponents of the typical learner-centered approach do not say that people should have little or no control. They point to research about critical learning variables that help us make sound instructional decisions about what types of control to allow. Table 2 discusses these two variables. Prior Knowledge The knowledge and skills a person possesses about the topic. Lana has a great deal of knowledge about the system, so the foundational terms and functions aren’t new to her. Complexity of Material The inherent difficulty of the material. The system is complex to use for all but the simplest uses. Knowledge and skills in some parts refer to knowledge and skills in other parts. Performance for more complex uses requires foundational knowledge and knowing how to use other parts of the system. Learner control research is complex, and it has some ambiguities. For example, research shows that control can improve motivation and people prefer more control. But it also shows that being able to make good instructional choices largely depends on what you already know about the topic (prior knowledge). And that without the prior knowledge to make good decisions, people with no or less knowledge may end up choosing routes that are inefficient and frustrating. And they typically end up with knowledge and skill gaps as well as misunderstandings. Which version do you think had better outcomes? (Really…Think about this a moment before going ahead.) Interestingly, the Full minus program had better results because people had far fewer gaps in understanding. The Lean plus version took far less time. We need to get good results efficiently. But efficiency without effectiveness is simply getting to a bad result faster. Not good. For me, Lunts’ research also helps us understand that part of our responsibility is to help people get to a higher level of accurate prior knowledge. Not only does more expertise improve performance, it improves the ability to learn on your own. And this is ever more critical as business models rapidly change, resulting in the need for changes in worker skills. When material is more complex, we need to consider how the difficulty of the material interacts with prior knowledge. Table 3 shows the interaction of prior knowledge and material complexity. When material complexity is low, we can offer more control to participants. But we should typically apply program control when material complexity is high. People with less prior knowledge will need us to design in the right path and methods, to avoid high levels of cognitive load which can derail learning. People with more prior knowledge may still be able to control the path and methods, but should have guidance to reduce cognitive load, as needed. In all four quadrants, allowing people to control the pace makes sense, as they may wish to start and stop and review. The essential point, then, is that learner control makes sense for less complex materials. And program control makes more sense for more complex materials. But people with more prior knowledge of the topic are more easily able to handle learner control in more complex learning situations. Complex learning situations involve integrating a variety of knowledge and skills and applying the integrated skills to life and work. It uses a great deal of mental effort as there are many interrelated things to remember and do. For example, teaching a patient to monitor their blood sugar using a glucometer is quite a complex skill, involving numerous steps that are interrelated. Next month I’ll offer guidance from research on a very closely aligned topic: Minimal guidance versus direct instructional methods, a follow-on to what we discussed in this article. I hear (too) many L&D people say it’s best for learners to figure it out for themselves but that’s the opposite of what most research tells us about how we learn and the causes of cognitive load. The information in this article should help you understand that this approach isn’t best for all. Chang, M.-M., & Ho, C.-M. (2009). Effects of locus of control and learner-control on web-based language learning. Computer Assisted Language Learning, 22(3), 189-206. Chung, J. & Davies, I. K. (1995). An instructional theory for learner control: Revisited, Proceedings of the 1995 National Convention of the Association for Educational Communications and Technology, 72-86. Jones, Leo. (2007). The Student-Centered Classroom. Cambridge University Press. Lunts, E. (). What does the literature say about the effectiveness of learner control in computer-assisted instruction? Electronic Journal for the Integration of Technology in Education, 1(2), 59-75. Sweller, J. (2005). Implications of cognitive load theory for multimedia learning. In R. E. Mayer (Ed. ), The Cambridge Handbook of Multimedia Learning (pp. 19-30). New York, NY: Cambridge University Press. Sweller, J. (2008). Human cognitive architecture. In J. M. Spector, M. D. Merrill, J. V. Merriënboer, & M.P. Driscoll (Eds. ), Handbook of Research on Educational Communications and Technology 3rd ed., 369-381. New York, NY: Taylor & Francis Group.